Another of my New Year's resolutions was probably the same as many of yours. Not only am I getting my heart, soul and home in order, but I also intend to do something about this body, which is a mess after the holidays. Notice I didn't say "get my body in shape." That may be a (welcome!) side effect, but honestly, I will be content to simply be healthy, headache-free, and not so weary all the time. I hold no grandiose delusions of looking like a woman half my age. Today, I am on Day Ten of a 21-day detox program. I'm eating only fruits and veggies, mostly raw, with a tiny bit of brown rice or lentils, along with nutritional protein shakes and liver/gut cleansing supplements. Sounds nasty, I admit, but I am feeling more energetic already. Perhaps you've noticed that since living out of the U.S. we are being exposed to extra toxins in our food, water and environment. The longer you spend overseas, and the older you get, the more toxins accumulate in your body. Maybe you are dealing with fatigue and pain too. Untreated, these toxins lead to far worse symptoms than chronic headaches and snarky attitudes that slip out when I'm not feeling well. (Yes, I've been known to scream at my poor children, "LEAVE ME ALONE! I'm trying to have my devotions!") For the sake of the Gospel, it's time to start looking for the physical roots of some of my struggles. My family and friends want to enjoy me for many years to come. For that matter, they just want me to enjoy them, and not be so tired and crotchety. 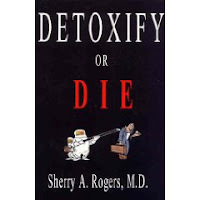 There is a perfectly awful book I just read--Detoxify or Die, by Sherry A. Rogers, M.D. I was blessed to find an alternative doctor in Ohio who tested and treated me last summer, and gave me a serious wake-up call regarding my risk factors for heart disease and colon cancer. My sister is a breast cancer survivor, and frankly, this was always a major concern of mine. The doctor tells me I have no medical markers for breast cancer. But, I do need to watch my weight. Since doing my first detox regime last summer, my blood pressure has normalized and my thyroid is kicking back in. Best of all my mood swings were drastically reduced. I'd mention the pounds I lost, but sadly I found them again. Like decluttering, dieting is a lifelong venture. No one said this is going to be easy, but I sure would like a taco or enchilada right now. I'm praying for each of you today, that you find health for your body and spirit this year. Bless you, my new friends. IRL*Day 10 of a lifelong process of detoxification. It is all connected isn't it? While I don't want to idolize my health and care for my body - I also don't want to neglect this thing that God says is the temple of the HOLY SPIRIT! I want to be healthy and ready for what HE calls me to. Stewardship....stewardship. And if you get to craving that taco too badly - come over and I'll make you a green smoothie! Interestingly enough, i think I get way FEWER toxins in my body since i moved out of north america! Think of all the huge amounts of preservatives in the food there, the un-natural way their fruit will last for a very long time whereas now i know the average tomatoe does not last 3 weeks like at home. Bio-engineering the food in north america surely does not make it automatically healthier. I eat very organic here in africa. I dont have to worry about additives in food like 80% of the north american grocery stores nor preservatives in my fruits and vegetables. I get them fresh from the field. Sure they don't last as long on my shelf or in my fridge as the bio-engineered ones, but we are way healthier without the additives and preservatives. I do agree that environmental toxins such as vehicle emissions and even the dust i breathe in here can be a health concern and that cleanses are an awesome idea! Just would never want to say that my food is less healthy here or more toxic- since the opposite is true! Good luck in your last 11 or so days of the cleanse! May you be fully enriched with energy and blessings! Hmmm. Now that you mention it, my health problems didn't come to a true crisis until after we got to the States last summer. Maybe that was it. Never thought about it. What I was thinking about were bus fumes, pesticides, plastic burning, and other kinds of poisons. Either way, read the book to get yourself completely grossed out and paranoid. Or don't read it, and just do the de-tox and live happily ever after. For sure the produce is better in Mexico. I'll say that for sure. Doing a raw diet in the U.S. would be expensive and maybe not even that healthy. Ya think? Praise the Lord for abundant fruits and vegetables here. Many of our sisters out there are not so blessed.